The most Vivacious, Outrageous, Humongous Marvels of Mother Nature. It’s the City’s largest collection of colossal family fun. The second annual Pittsburgh Monster Pumpkins Festival features the famous fruits that tickle everyone’s fancy in October—except these pumpkins come with one truly titanic twist! THEY’RE HUGE..flaunting a supersized girth that stems from the DILL’S ATLANTIC GIANT seed—producer of the biggest breed of cucurbits on the planet—with world record weights well over 2,500 pounds! A rowing race that will leave you dazzled in disbelief! Yes, we said “row”…for while the festival boasts all sorts of pumpkin-themed activities—carvings, drops, food and frivolity—the highlight of weekend is the “Great Pumpkin Paddle” that happens in the Allegheny River. Ginormous gourds turned into comical canoes paddling in one preposterous all–pumpkin boat. Mark your calendar now, Saturday Oct. 19, for the “Greatest Growth on Earth” pumpkins so big, so heavy and so fascinating to behold you’ll be doing double takes all day long. And, It’s ALL FREE…You’ve Got to SEED It, To Believe It! Showcase your pumpkin pie pride! Enter the Bella Christie “Pumpkin Pie Plunge” eating contest and pack your tummy with calories so yummy. Gotta penchant for pie that’s whipped cream piled high? We’re searching for the ultimate pumpkin pie lovers. The ones who savor sugar, spice and dessert always twice. It’s your time…to showcase to all your pumpkin pie pride! Enter the Bella Christie “Pumpkin Pie Plunge” eating contest and pack your tummy with calories so yummy. Your challenge? Fly, face first, into a full size pie from our friends at Bella Christie and Lil z’s Sweet Boutique, the region’s most marvelous maker of scumptious sweets. Aah, but there’s a trick around this treat—no hands allowed…we set the time limit and whoever plows through first, or eats the most [we weigh pies before and after] gets the win and grabs the prizes! Got what it takes? Click here and enter our “Like and Comment” contest for a chance to take your spot at the competitive eating table. There are competitions each day, Sat., October 20 and Sun., October 21. We’ll only select 10 eaters for each day…so do it now, then start polishing your pie eating prowess. …the makers and bakers at Bella Christie will also have on site all their mouth-watering cookies, cupcakes, candies and confections. Come see the GIANT Cotton Candy Ball on display…and enjoy FREE cotton candy giveaways…then delve into the assorted and delicious Christie concoctions prepared especially for the festival. And, with Halloween right around the corner, they’ll also be showcasing “dragon’s breath” at one of their immensely popular liquid nitrogen stations set up at the event—flash freezing flavored sugar that allows the eater to exhale a wintery-like breath of smoke! Master Pumpkin Carvers…Giant Pumpkin Drops from Cranes…A World of Toasty Fall and Orange–Themed Fun! “Pumpsburgh Profiles”—The Country’s Best Master Carvers Will Craft Pumpkin Portraits of Famous Pittsburghers. At right, Russ Leno poses with one of his colossal creations. Leno holds the record for the “World’s Largest Giant Pumpkin Sculpture” at 1,262 pounds!!! The country’s top pumpkin carvers headline the first Pittsburgh Monster Pumpkins Festival, all of them renowned performers in this unique field of “temporary art.” Headlining the event are: Russ Leno, Gus Smithhisler, Steve Dahlke, Dean Murray, Pennsylvania’s Danny Kissel and Pittsburgh’s own, Jim Morgan. Together, the six artists have earned many national and international awards and have appeared on TV shows such as: Food Network, Tonight Show and Martha Stewart. The carvers will arrive several days before the event to begin their work—picking, scraping, etching, chiseling and fashioning—raw pumpkin into portraits of some of Pittsburgh’s most prominent people including: Mister Rogers, Andy Warhol, Andrew Carnegie…and a few other surprise denizens of distinction. 1. The Pumpkin Piñata—for the kids of course…twice during the weekend, we’ll hollow out one of these big boys and fill it with all sorts of candy treats. Except there’s no pounding with a stick or bat…we drop it straight to the ground, then open the gates and let the kids pick up the pieces—of candy, not pumpkin. 2. The Project Bundle–Up Pumpkin Splash—we’ve teamed up with WTAE Channel-4 and the Salvation Army to assist this worthy service effort—that provides new winter coats, hats, scarves, mittens and boots to thousands of underprivileged western Pennsylvania children and senior citizens annually—with one gigantic splash of a promotion. 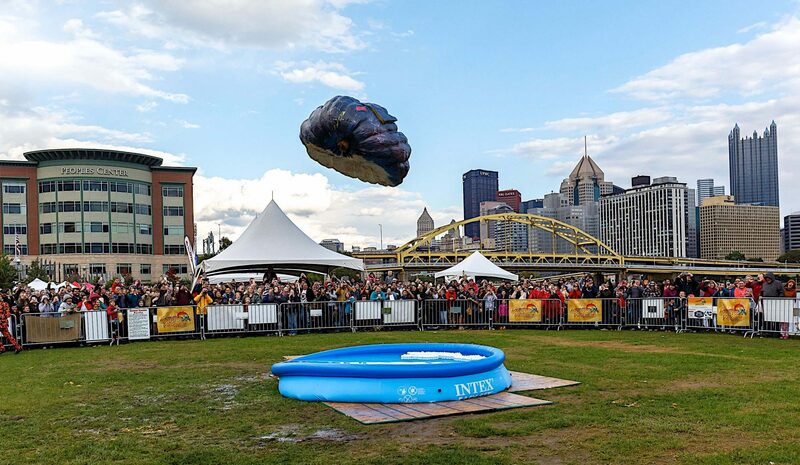 Here’s how it works: we fill a 12’-diameter, 3’-deep inflatable poo l with water and numbered ping pong balls. A reasonable donation gets you one ball in the pool and one chance at winning. At the end of the day Saturday, we release the pumpkin into the pool. The prodigious plunge wildly disperses the balls. The one traveling farthest from the pool gets the goods. So get your gourd face on and into the game…to donate and discover the prizes—click here! What Happens When an 1,800 Pound GIANT PUMPKIN Falls 100 Feet to the Ground Into a 3-Foot Pool of Water! 1,800 Pound Pumpkin Drop to benefit Project Bundle Up! Kids can stop by the Baierly Toyota “Pumpkins in a Pickup Patch” for a free pumpkin! Pumpkins are the theme, fun and flavor of the event. And, while our giants are a little large for you to take home, we do have hundreds of “right-size” pumpkins for families and kids…ready to be decorated and displayed for Halloween. We’ll be giving away FREE, soccer-ball sized pumpkins all weekend long while our supplies last at the Baierl Toyota Pumpkins In a Pickup Patch! Just look for the shiny new Toyota pickups on site with their truck beds filled to the brim with Halloween’s favorite fruit. One per family please…and while you’re in the patch take advantage of the decoration station nearby…where our artists can give your pumpkin a friendly, silly or spooky face. Western PA’s Dave Stelts with his incredible 1,934-pound pumpkin at the 2018 Ohio Valley Giant Pumpkin Growers weigh-off. Dave’s resume is at the top of the Who’s Who book of giant pumpkin growers. He has 10 total first place finishes at GPC-sanctioned weigh-offs and has grown over 50 pumpkins exceeding 1,000 or more pounds. He set the GPC world record in 2000 and finished 2nd and 3rd in 2009 and 2011 respectively. Meet Dave at Pittsburgh Monster Pumpkins Festival…and see this incredible fruit which one of our master carvers will turn into one giant pumpkin portrait! Staged on the Market Street Pier at the Riverwalk, three regional champion pumpkins will be on display—as officially designated by the Great Pumpkin Commonwealth [GPC]. Are all expected to be in excess of 2,000 pounds! Members of the New York, Michigan and the Pennsylvania Giant Pumpkin Growers Association (PGPGA) including western PA’s own Dave Stelts—former GPC president, world record holder and one of the most prolific growers in the world—will be on hand to answer questions and detail the level of determination and drive necessary to turn a tiny seed into a towering pumpkin. Seed Diving…digging in to dig’em out! Someone has got to do it…preserving seeds for next year’s crop of giants is paramount…members of the GPC are constantly refining techniques, soil science and growth experiences…which each new growing season begins with the seeds harvested from the champions the year before. But to get them, you have to get in them…in a practice known affectionately as “seed diving.” Our champions will demonstrate and, if you’re willing, suit up some diving daredevils from the crowd who want to get a feel for how it’s done. Seed diving is the colorful name given to the practice of extracting the seeds from cultivated pumpkins so they can be used for the following year’s harvest. Giant Pumpkins carved, painted and racing are the featured attractions at the Pittsburgh Monster Pumpkins Festival. Pittsburgh’s signature Fall festival, Pittsburgh Monster Pumpkins Festival, features tons of FREE family fun including foods and crafts, hay rides, kids zone and plenty of giant pumpkin excitement. Foods, Drinks, Crafts…and Lots of Fall-Like Things to Fill Your Day. Can you already taste the pumpkin pie, breads, cookies…smell the aroma of a pumpkin-spiced coffee, or pumpkin infused ale? We’ll have all the traditional foods and drinks that come with October in a banquet of tasty treats and enticing eats. And, we’ll also feature a eclectic row of craft vendors, product and trinket makers, many from areas right here in our hometown…proud entrepreneurs and talented artisans with lots of unique handmade offerings that add tons of color and atmosphere to the festivities. Some Kool Kids Stuff Too!